[Project Name] was compiled with optimization - stepping may behave oddly; variables may not be available. And of course I'm not able to debug the code. To be specific I'm trying to debug UIImageView+AFNetworking category which seems impossible. Changing the code has no effect (tried NSLog, etc) and when trying to step in compilers goes to assembly code and shows UIImageView+TVASTAFNetworking as category name which does not exist anywhere in the code base. UPDATE I forgot to mention that Optimizer is set to none for both release and debug configuration and I am in fact using Debug config. Strip Debug Symbols Is off as well. 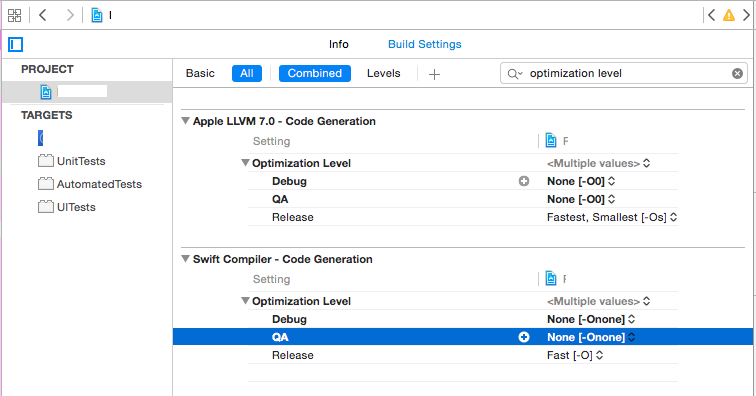 If your project is using Swift, there are two separate "Optimization Level" settings in the project/target configuration. 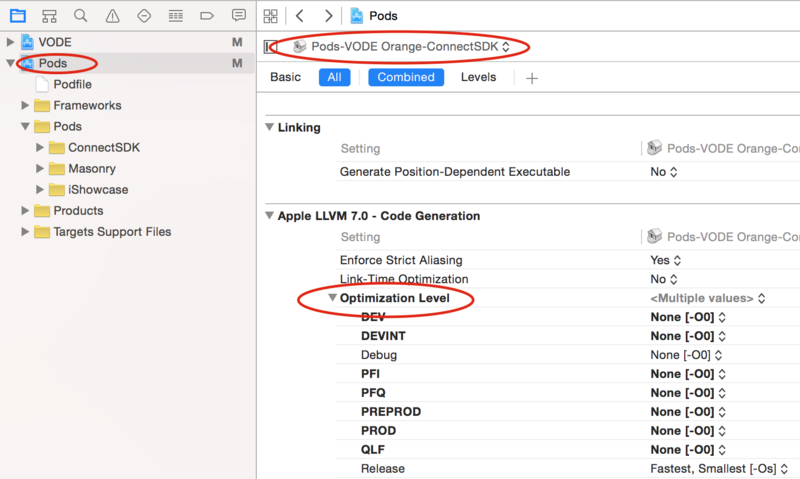 Search for "Optimization Level" and you'll see two settings, one for LLVM and one for swift. Set the appropriate setting (None [-O0] for LLVM and None [-0none] for Swift) for the build config in question. Doing this resolved that warning for me. Click on your scheme in the top-left corner of Xcode. Click on the "Build Configuration" dropdown. and change it to Debug mode. In my case, it only happened when debugging step by step through a cocoapod dependency. So even if you have your main target and project settings correctly set (Strip Debug Symbol=OFF, and Optimization level None), you need to make sure it is the same for the Pod project your hitting the breakpoint from. By default, cocoapods will usually generate pod configurations as Release, this Podfile line allows you to tell it they are debug. I ran into the same issue today, and figured it out (at least in my case). I'm also using CocoaPods, and I was having this issue when running my test target (Swift mixed with ObjC). I'm using Xcode 7.2, with iOS 9.2 SDK. The surprising thing is that even though the resolved Optimization is None [-O0], only after changing the project setting from -Os to -O0 did the compiler stop optimizing the target. It's been a long time but I finally solved the issue. There is a third optimization flag LTO or Link Time Optimization and Surprisingly no one have mentioned it here and for some reason I didn't pay attention to it either. It's right there above the Optimization Level setting as you can see in many screen shots posted here. Are you sure your debug configuration doesn't optimize code (it shouldn't)? It looks like you've accidentally enabled optimizations for debug configuration and you should turn it off from target's settings. This error happened to me twice, and in every case was a mistake in the URL parameter used to request a service. In one case the URL had some space in the port section in the other case some Optional Value wasn't being unwrapped. So the fix was to be sure the url for the request is well formed. More information about my case, and similar reporting the same here. This may be an oversimplification, but are you building for Release or with optimization (which remove symbols from Swift or LLVM) too high? 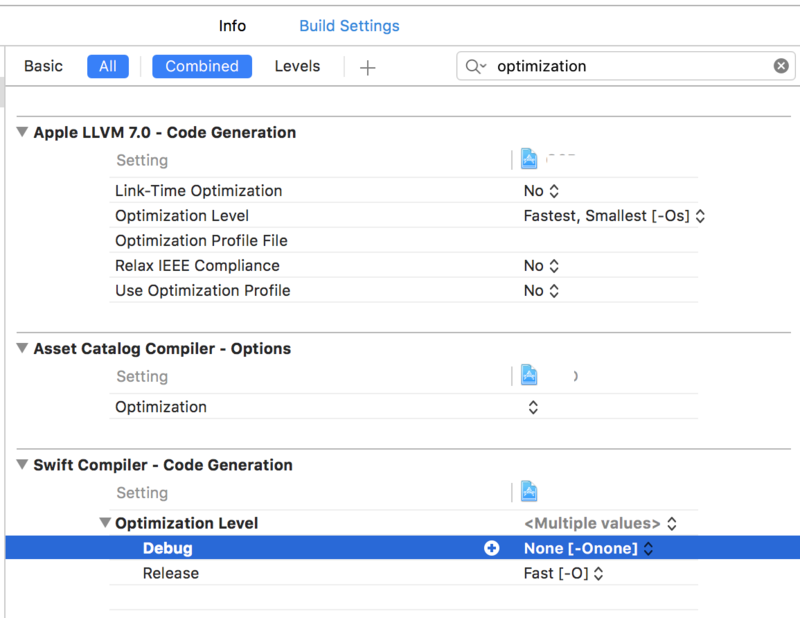 If so edit your scheme and switch to Debug, or edit your Build Settings for swift or LLVM optimization to None (0). Just in case someone is facing this issue while debugging a pod that uses a C library internally, there is another thing you have to change in the project settings to make it work in addition to everything else listed in the thread. Go to Pods project settings -> Your C-using target -> Build Settings -> Apple Clang - Custom Compiler Flags -> Other C Flags and remove the -O3 flag that got there somehow. Not the answer you're looking for? Browse other questions tagged ios afnetworking-2 xcode7 or ask your own question. Xcode build & debug strange behaviour? 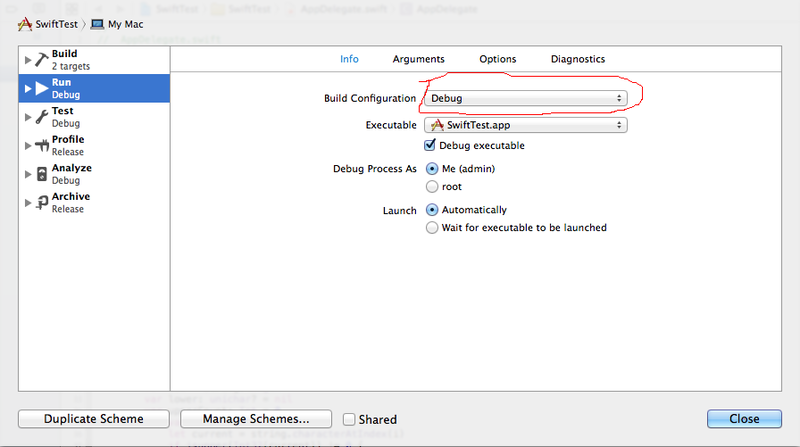 How to debug a Delphi iOS FireMonkey application in Xcode?